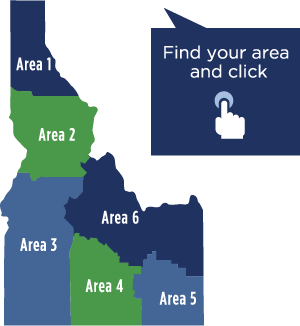 The Idaho Commission on Aging (ICOA) strives to assist all Idahoans to age successfully. When illness or injury occurs, we can equip ourselves with the knowledge, skills & support we need to manage those issues, whether for ourselves or others. The ICOA has made outreach & education a high priority. Please follow us on Twitter or Facebook for current ICOA and aging information. You can also view our Events & News on this site! This is a future access point for The Aging Education Gateway, which will be a portal providing up-to-date interactive learning opportunities to build our personal tool kit in areas such as wellness, chronic conditions, dementia, respite, adult protection, nutrition and more. All content will be FREE OF CHARGE and available to the general public. We can use the area map below to find the nearest local Area Agency on Aging. Also to the right, “Quick Tips” and “Resources” are available to better assist us with finding reliable information and supports.